Whether speed cameras actually do save lives seems an easy assertion to test: measure the numbers of casualties at a site over a period, say two years; introduce a speed camera; re-measure the number of casualties over an equal period, and any reduction is due to the camera. But it's not really that simple. Many other factors are at play that might make cameras appear to be more effective than they really are. And these factors are often ignored when evaluating the performance of speed cameras at improving road safety. 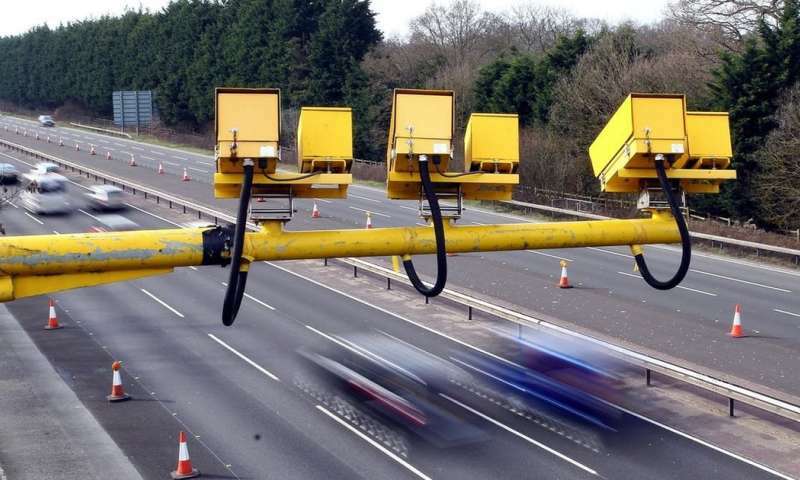 Since around 2000, there has been a boom in the use of speed cameras in the UK. Around 800,000 drivers are caught speeding by cameras each year. With the minimum penalty for speeding including a £100 fine, cameras have often attracted criticism as just a money-making scheme rather than an effective way to prevent collisions and prevent death and injury, as claimed by road safety organisations. One such recent estimate suggested that adding around 1,000 additional cameras in the UK could reduce collisions by 1,130, serious injuries by 330 and save 190 lives annually, saving around £21m. So who is right? Do speed cameras actually save lives? Cameras are normally installed following a period of unusually high numbers of collisions at a particular site. However, these high numbers may not necessarily be an indication that the site has become more dangerous and therefore in need of treatment, but just due to random variation (blips) in when and where crashes occur. In road safety data, there is a general tendency for collision incidents at a site to reduce anyway following a short-term rise in their number, without any treatment (such as a speed camera) being applied. In statistics, this is known as regression-to-the-mean (or RTM). We also know that the long-term trend in collisions has generally been downward due to factors such as improved vehicle safety and better driver education. So if we observe a reduction in casualties at a site following the installation of a camera, we need to ask how much of this reduction would have happened anyway (the RTM effect)? How much is due to general trends in road safety? And how much can we actually attribute to the camera itself? The effects of RTM and trend can vary between camera sites. Evidence from some camera sites in the UK suggests that these effects can account for all the observed reduction – indicating that the camera has had no impact at the site at all. So conventional approaches to assessing the impact of cameras on collisions may be overoptimistic. This has clear and obvious implications when considering the cameras' value-for-money and whether the investment could have achieved a better return elsewhere. But this doesn't mean that there aren't potential road safety benefits from using cameras. Cameras could certainly have a significant impact in terms of preventing medical treatment costs as a result of road traffic collisions, but we need to apply more rigorous statistical approaches for evaluating the data to avoid bias. Also, we cannot ignore the fact that the presence of speed cameras can remind drivers of the importance of speed limits and the penalties for being caught speeding, and therefore cameras could be having a more general and beneficial impact on driving elsewhere other than just at camera sites. However, accurately capturing this positive effect from the data is far from straightforward. And unfortunately, the situation is further complicated by the presence of cameras actually causing some motorists to drive erratically when approaching, for example, by braking heavily, which itself can cause collisions to occur. To make matters worse, half of the UK's fixed speed cameras may not even be turned on. So the situation is far from simple. Methods to accurately account for RTM and trend often require knowledge of advanced statistics which may not always be available within a road safety team, and so it is likely that these confounding factors are not being considered consistently across the country. Software is becoming increasingly available for evaluating site-based road safety interventions but this is not yet commonplace. More recent work also points towards a more proactive, rather than reactive, approach to identifying sites that may have a road safety problem. This would enable future investment decisions to be guided by methodology based on the predicted number of collisions at sites across a road network rather than applying a treatment reactively after a threshold number of people have been killed or seriously injured. So, do speed cameras save lives? The answer is almost certainly yes, but probably not always to the extent that people are led to believe. The whole argument that speed cameras save lives is begging the question that speed is what causes accidents, instead of otherwise negligent driving, inattention etc. You could be tapping on your cellphone driving under the limit, and still kill someone in a crash. Meanwhile, the guy who's going 10 past the limit is more likely to watch where he's going because he's constantly catching up to traffic. What you have here is an example of the streetlight effect. Speed is one thing you can measure, so that's what you try to control in hopes that it would have something to do with the actual causes of accidents - like looking fr your dropped keys under a streetlight because there's light there. The act of "going fast" does not CAUSE crashes. Speed is just the easy thing to blame and measure because it's hard to blame and measure lack of skills, distractions, and other bad habits and gross errors. Nobody ever blames a crash on an under-skilled driver. Studies that studied speed camera studies noted that the more rigorous the study, the less benefit photo enforcement showed, and the most thorough studies reported negligible and sometimes negative safety benefits. The premise is also flawed when you consider that some roads have few crashes and others have more. To say that a speed camera is the best way to fix the problem is to say that the dangerous road has an unnatural concentration of "bad" drivers or speeders that the other road does not. This is patently false of course because the quality of drivers will vary little by location. Officials like these devices for the revenue they bring in and also because they can appear to be "doing something" about the problem. While speed may not cause accidents, it does make them worse when they happen. The velocity squared power law. The relative difference of going slightly over the speed limit at 65 mph isn't actualy all that great. Going 70 instead of 65 gives you 15% more impact energy. The difference of speeding is greater at low speeds, such as 40 over 35 which gives you 30% more impact energy, but then, at lower speeds your impact energy is already low and the severity of accident is less anyhow. The speed cameras are mainly for trapping people going slightly over the limit because they'd rather watch the road than their speedometers. If the UK posted main road and Motorway speed limits at the safest 85th percentile speed points, instead of typically 10 mph lower than the safest points, speed cameras would be unnecessary for any purpose - AND safety would improve overall. The only reason speed cameras are used now is to raise revenue that comes mostly from safe drivers that endangered no one. I cannot believe that we are actually discussing the worth of human lives and human injuries as an argument over speed cameras that enforce the speed laws. It's all abstract and you can be libertardian about it because of course it'll happen to someone else and you just gotta get there 2 minutes earlier, until it's you or your kid gets run over then you wanna sue. Just drive the fxxking speed limit and let it go at that. Get over it. It's safer to drive according to the traffic, than according to your speedo. The exact speed is not important. The problem is that cars in general don't actually have accurate speedometers. They're factory-set to show 10-15% too much, in some cars but not in others, and people have different size tires etc. which means if everyone was staring at their speedometer (dangerous) they'd still be going at varying rates and either ending up doing well below the speed limit (dangerous) or overtaking constantly (dangerous). Best just look out the window and drive like everyone else drives, but that means your speed can occasionally slip +5-6 mph above the limit, and then the camera flashes, and you get a ticket. Getting there 2 minutes earlier isn't a huge personal achievement, but if a highway carries 10,000 cars an hour, that two minutes quickly amounts to 300-400 man-hours of saved time each hour. Losing two minutes because of slow traffic basically costs the worth of a car every hour in loss of general productivity. A few years ago, some UK authorities proposed raising the Motorway speed limits in many areas to 80 mph to increase efficiency and improve safety. Unfortunately, the groups that get to spend the loot from speed cameras prevailed to keep the limit posted improperly and less-safely at 70.